Scandinavia has led the world with sustainable practices for generations. Now, more than ever, this commitment is generating tremendous interest from other jurisdictions as the region strives to create a transport system free from reliance on fossil fuels. Recently, Denmark, Sweden, and Norway have pledged to tackle fossil fuel use by setting and meeting ambitious clean energy goals in alignment with targets set at the Paris accord. Denmark alone has pledged to be 100 percent dependent on renewable energy by 2035 and fossil fuel-free by 2050. Similarly, Sweden is aiming for complete renewable energy reliance by 2040. Norway's National Transport Plan states that all new cars, buses, and light commercial vehicles manufactured after 2025 should be zero-emission. These are impressive and inspiring goals - and the world will follow these ambitions. However, even though electric vehicles have achieved significant market penetration in Scandinavia, most vehicles and buses still run on fossil fuels. Therefore, if the region is to meet its clean energy goals, it needs to create a significant shift in the types of vehicles allowed on the roads and the energy used to fuel them - and the shift needs to happen quickly. Switching to fuel cell buses would have a massive impact on reducing fossil fuel use in the public transportation sector. However, many cities and bus operators struggle with shifting to zero-emission public transport because they’re concerned service levels and operational flexibility will suffer. Fortunately, there is a wealth of evidence that proves there is no cause for concern. Fuel cell electric buses have over 15 years on the road in diverse environments; many are similar to those in Scandinavia. They have travelled more than 11 million kilometers, and have been proven to meet all the needs of transit operators around the world. From the hot deserts of Palm Springs, California to the winter mountain conditions of Whistler, Canada. Furthermore, these buses are already deployed and operational in many EU cities including Oslo, Norway, Aberdeen, Scotland, London, UK, Cologne and Hamburg in Germany. The technology is mature, and now offers concrete benefits for regions like Scandinavia who are leading the transportation sector revolution. 1. Maintenance and service capabilities are already in place. The Ballard Europe service team is well established and stationed in Denmark, allowing for efficient repairs and service on fuel cell bus fleets throughout the European Union. Beyond servicing and repairing the buses, the team actively gathers data that it shares with transit agencies to help them continually improve the buses’ performance in these unique environments. 2. Fuel cell electric buses have high daily ranges and route flexibility. Hydrogen fuel cell buses can run for 450 kilometers during any given 18-hour shift. If the range requirement is farther, that’s not a problem as it only takes 10 minutes to refuel. This is the same performance of traditional diesel-powered buses. In addition, fuel cell range capability means bus routes don't need to be altered. When you combine this with the savings associated with the expensive en-route charging infrastructure required by 100 percent battery powered buses you have a compelling story to tell. 3. Hydrogen buses have a demonstrated history of meeting performance requirements. Fuel cell buses perform just as well as diesel in terms of their availability, acceleration and gradeability. Furthermore, they operate well in cold climates, which is imperative for Scandinavian winters. Hydrogen powered buses aren't dependent on the slow charging times and reduced outputs of 100 percent battery configurations in cold weather. Another advantage is that water and heat are the only two byproducts of fuel cells. In the winter, the heat can be used to warm the passenger compartment, eliminating the need for separate diesel heaters. 4. Hydrogen refueling infrastructure is already built and operational. Scandinavia is a world leader in the installation of hydrogen refueling infrastructure. 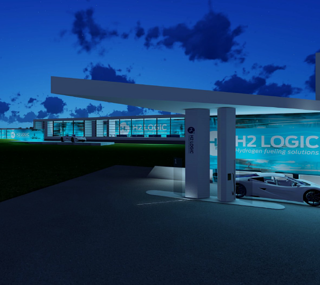 Denmark already operates the world’s first country-wide hydrogen refueling network. Norway has numerous refueling stations and Sweden is close behind, with more likely to be built in the coming years. Furthermore, fuel cell bus refueling time is very efficient - as low as 10 minutes. This is much faster than the charging time required by 100 percent battery powered buses. 5. Hydrogen bus technology provides significant environmental benefits. 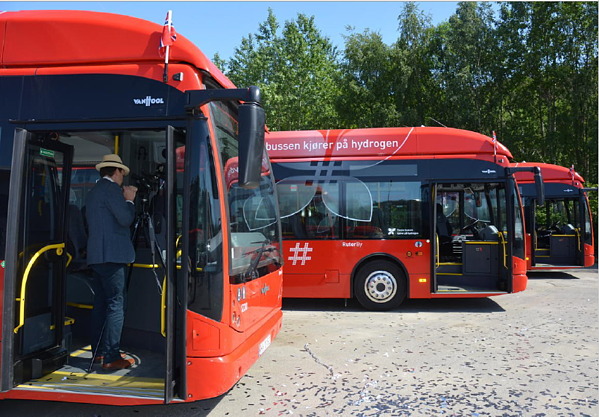 Hydrogen fuel cell buses powered with locally produced hydrogen from renewable energy will help Scandinavia meet its zero emissions goals. Among the advantages of hydrogen energy is the ability to use wind and solar power with electrolysis to produce clean hydrogen. In addition, each fuel cell bus powered by renewable energy will reduce CO2 by 122kg for every 100km of travel, in comparison to diesel buses. The benefits will increase exponentially as more and more fuel cell buses are deployed. Finally, locally produced hydrogen provides fuel source security. There will be no need to import offshore oil and deal with the potential disasters associated with pipelines and seaborne oil spills. In order to meet their clean energy goals, Scandinavian countries are under pressure to replace their fossil fuel powered vehicles quickly. Transit agencies and operators are in a key position to advance these goals by switching to zero-emission buses. Among the zero-emission buses available, hydrogen powered buses are the ideal solution to Scandinavia’s clean transport challenges. They offer a proven, viable technology that will provide benefits for decades to come. 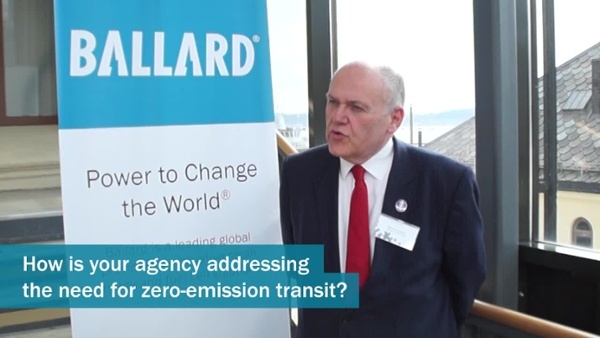 Learn more about Ballard's fuel cell-powered buses in demonstration globally.